Local organizer, Proof Label, which has created a huge sensation in Singapore with Korean Pop Night Concert last year is coming back with a sequel this year – named Korean Music Wave 2011. 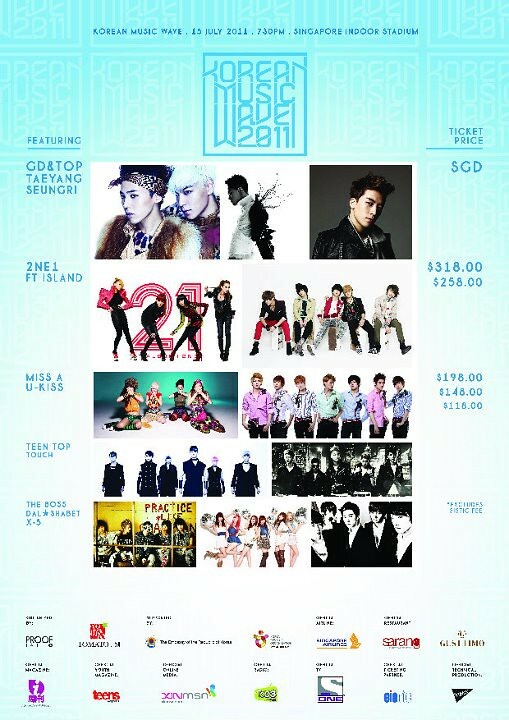 Korean Music Wave 2011 will have a lineup of 10 korean pop acts and Big Bang and 2NE1 has been revealed to headline this concert this coming July 15 at Singapore Indoor Stadium which also marks 2NE1’s first visit to Singapore! FT Island, U-KISS, Miss A, Teen Top, The Boss, TOUCH, DAL★SHABET and new boyband, X-5 will perform alongside. Please credit https://scanationsg.wordpress.com if you take out or hotlink any of the contents of this site and post it anywhere else. ScanationSG can be contacted via email, twitter or formspring. Fill in your email to get the latest update on Scanation Singapore.